alaTest has collected and analyzed 30 reviews of John Lewis Nembus Semi Flush Ceiling Light. The average rating for this product is 4.7/5, compared to an average rating of 4.7/5 for other products in the same category for all reviews. We analyzed user and expert ratings, product age and more factors. Compared to other products in the same category the John Lewis Nembus Semi Flush Ceiling Light is awarded an overall alaScore™ of 85/100 = Very good quality. I bought 2 of these and the effect of providing good lighting around the room was recognised by friends and family. A good quality lamp which looks great in my lounge. It gives off a bright light and is also dim able. It looks so good that I am going to order two more for my hallway and landing. Got this light first for our newly decorated lounge , loved it, looks very nice and gives plenty of light. Later we got them for our hall way and landing . Had all of them for a few months now, look great and now issue so far . Highly recommend . Really pleased with this flush ceiling lamp it looks great in my dining room. Good quality and value , easy to fit. Good quality product giving a good light Particularly good for low ceilinged room. i am enjoying it. Pity two bulbs went within a month but that I daresay was chance. Would buy the product again for other rooms. Very pleased with our choice .The Nembus semi flushed light was fitted on our upstairs landing. It gives good bright light and suits our needs. Would recommend. 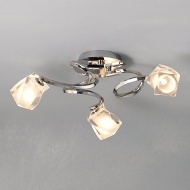 Found these to be a very attractive ceiling light that worked very well in our bedroom. Easy to install. Very bright spread of light and works very well with our dimmer switch. This product is just what we required - a bright light and two arms that can be moved into position to give you the best possible balance. Used for lighting garage conversion with not too much headroom. Good looking, excellent lighting - and no headaches!